As humans, we have a natural tendency to form groups to fulfill our social needs. We enter into playgroups as toddlers, where we learn things like how to interrupt each other, talk over each other, and cry when we don’t get our way. It is the first of many graduated steps in our social evolution, in which group activity develops into frat parties, book groups, and bridge clubs until it culminates with Friday night bingo at the Hobble A. Long Nursing Home. Smack in the middle of these phases is the evening dinner group, a stage which generally emerges somewhere between our last toga party and our last mortgage payment. A dinner group is best defined as several couples approaching middle age that get together for food, drinks, and conversation in which the degree of political correctness is generally commensurate with the quantity of tequila in the margaritas. The early life groups condition us for appropriate dinner group behavior. For instance, frat parties teach us how to flirt, bridge clubs teach us how to gossip, and book groups teach us how to look engaged while we silently reflect on things like what ingredient is missing from the artichoke dip, where the hostess bought her diamond earrings, and how much she paid for them. Dinner groups have become a legitimized form of entertainment for suburban couples that are too tired from the weekly work grind to make a dinner reservation. It’s for those of us who, after a night of bowling at Plaza Lanes, have to get epidural steroid injections to relieve our back pain. It’s for those who stopped going to the movies when On Demand made it possible to watch movies in bed. A dinner group is the ideal social activity for couples. It requires no reservations, no dress code, and no designated driver. You can slack off at home and still not feel like a Saturday night loser because you’re slacking off with other people. Dinner groups are popular with religious organizations because instead of members going to church or synagogue to worship, they make a pilgrimage to each other’s houses to pray that cocktails will be served with dinner. In the Christian religion, a dinner group is called a fellowship dinner—members eat a potluck dinner over wine. In the Jewish religion, it’s called a Havorah—members eat a potluck dinner and say blessings over wine. In the Christian Science religion, it’s called a ward dinner—members eat a potluck dinner over the bible and complain about how they’re not allowed to drink wine. With a dinner group, there are three important rules to keep in mind: One, the meal must be lactose free, hormone-free, low fat, organic, and include a vegetarian option. Two, members must take turns hosting. It doesn’t matter if your kid has a bad case of shingles or your plumbing has backed up, there’s no free pass. The third rule is, after the meal, the men must go into the other room to watch a football game while the women stay in the kitchen and complain that all their husbands do is watch football. So if you’re reaching that point in life where you’d rather poke lit cigarettes into your eyeballs than go out for a night on the town, consider joining a dinner group. It may have its drawbacks, but enjoy it while you can because the next stage will be bingo at the nursing home . . . with dinner over prune juice. Dinner groups are even more stressful than making reservations; don’t you have to talk to people at your groups? I’m still in the book group phase of my life, but thanks for letting me know what’s next on my horizon. I look forward to your blogs every week because they make me laugh out loud. Thanks for that! OMG I saw myself in this post 100 times! I really enjoyed this post – saw you posted on Mr.Ducks blog and thought I’d stop by – so glad I did! I’m glad you stopped by too! Thanks for the kind words, and for subscribing! Thank God I was raised Catholic. 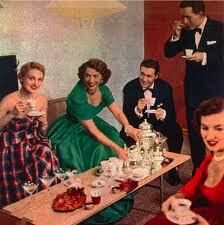 At least we never have dreamed of having dinner parties where we didn’t serve cocktails. Great piece. Kitty and I have indeed gone from Dinners to Diners. Last week fell asleep over a bingo card and spilled the prune juice. Love your punchlines! Love reading your posts more than once, because I relate to so much in them. I’m so entertained by everyone’s comments, I don’t need to go out!